What’s Inside The Aerial Rope Manual Vol 2? 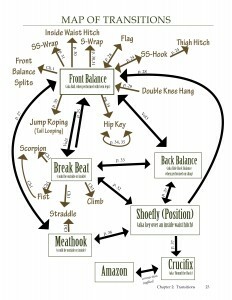 When I think of rope, I think of all the hard stuff: back balances, meathooks from a deadhang, one arm hangs, momentum, etc. But you can’t start there. 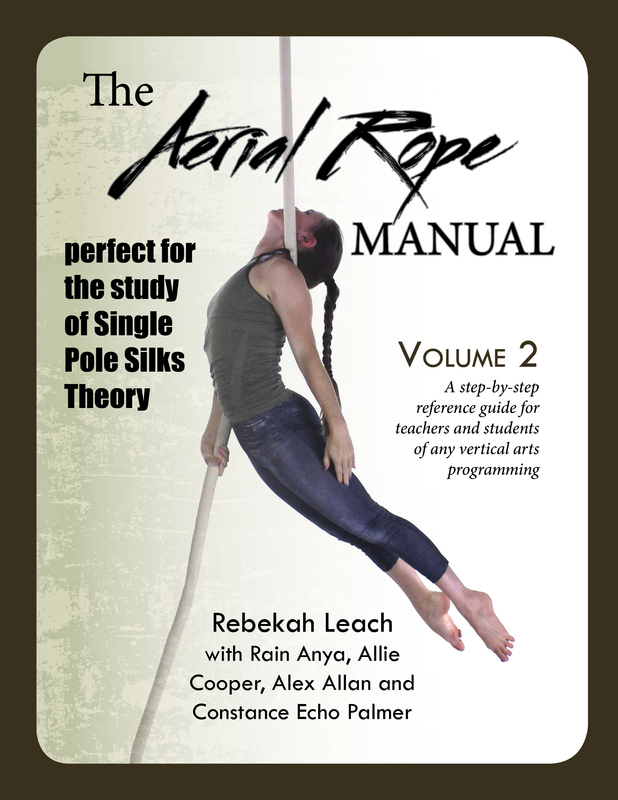 The Aerial Rope Manual Volume 1 is the starting place for anyone who is looking to start their aerial journey and build up strength. However, The Aerial Rope Manual Volume 2 feels like this is where it really starts. We get to the good stuff. The hard stuff. Chapter One introduces more building blocks of rope that are generally harder than what was found in Volume 1. I feel like once a student knows every building block of a certain apparatus, then the fun can begin. The rest is just choreography and transitions between all the building blocks. 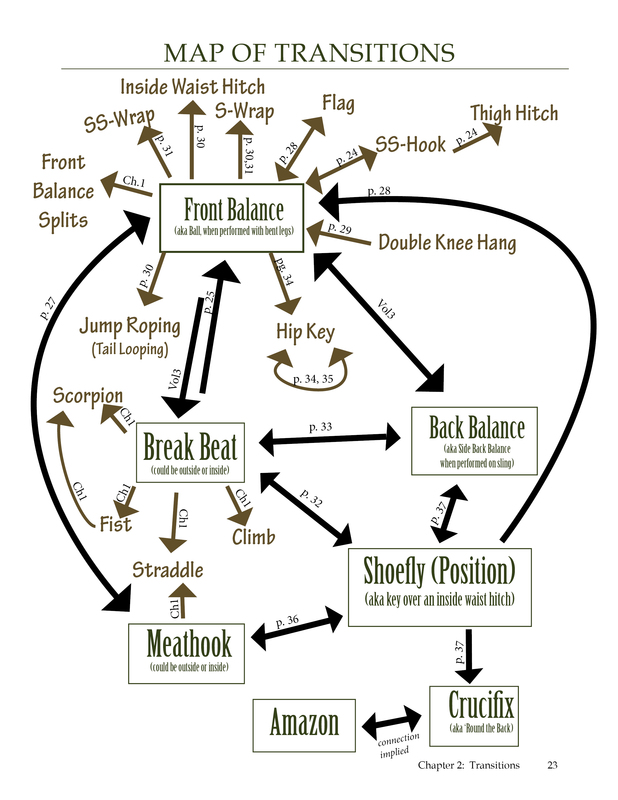 Some of the major building blocks are: inversions, climbs, opposite and same side wraps (OS and SS), s-wraps, crucifix (’round the back) and moves that are derived from these (all in Vol1). Now in Vol2 are: front balance, back balance, break beat, shoefly, meathooks, Amazon and the wraps of focus are all things in hitches. 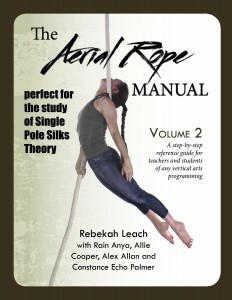 This is the kind of fun you’ll find in this book to help you navigate the world of rope (or silks with poles together). Chapter Four summarizes the findings of chapter three and adds to them with putting together a ton of information about all the major hitches. Since some classic hitches such as ankle and knee hitches were introduced in Volume 1, this chapter focuses mostly on the hitches around the thigh and waist. A large goal of the chapter is to provide a language with which to speak about any hitch. You will never read the words “inside” and “outside” the same after studying this manual. Chapter Five takes on a different direction all together, closing out the book with an introduction to momentum. In the words of one aerial teacher, this chapter is “worth rubies, diamonds and gold on its own.” It’s worth it to purchase the whole book just for this chapter alone. It contains all the foundational ideas that can then be applied to create your own momentum sequences into all the building blocks that have been covered thus far. Molly Graves commented, “Especially exciting is the final chapter on momentum pathways and beats—skills whose very nature makes them hard to pin down!” Dynamic movement can be tricky to put on paper, but with the help from expert rope artists such as Alex Allan and Allie Cooper, the world of momentum has been translated to a 2-D medium in precise detail. Overall, this book will help you understand the world of rope or fabric better. You’ll also get ideas for training moves, how to properly progress moves, what the prerequisites are for each move, and for teachers, get teaching tips from the best aerial coaches in the world. This book was a huge investment and is supporting a lot of artists. I hope you’ll support our work and help it to be continued by making a purchase of the book. Go here to check it out. Next Next post: What’s in a Warm-Up?